West Virginia American Water’s Huntington Water System was presented with the prestigious 20-Year Director’s Award from the Partnership for Safe Water. The Partnership for Safe Water is a voluntary initiative developed by the U.S. Environmental Protection Agency (EPA) and other water organizations to recognize water suppliers that consistently surpass EPA regulatory requirements. 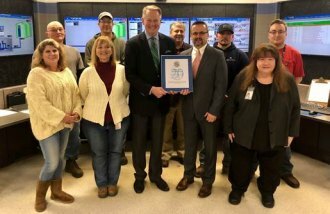 This morning, West Virginia American Water President Brian Bruce and Huntington Mayor Steve Williams presented the award to employees at the Huntington Water Treatment Plant on 24th Street in downtown Huntington. Bruce credited the Huntington plant operators and water quality staff for earning this prestigious honor. West Virginia American Water also presented Mayor Williams with a duplicate award to recognize the City of Huntington’s longstanding partnership with West Virginia American Water. The Partnership for Safe Water’s award-winning utilities demonstrate an outstanding commitment to delivering superior quality drinking water to customers. Huntington was the first water system in West Virginia to receive a Director’s award and today was the first water system in West Virginia to receive a 20-Year Director’s Award. Seven of West Virginia American Water’s eight water treatment plants have been nationally recognized with Directors Awards, and each of the company’s plants that have received this award have maintained it in every subsequent year.